I walk with Ralts walking beside me,holding my right hand with his left hand. As we approch the counter where Nurse Joy is at I lift Ralts up with one hand and place him on the counter and grab the Pokeball Pansear is in. "Hi I need the two of them healed. Be careful of the one in the pokeball. He was pretty mad when I caught him." I walk over to the waiting room and fall asleep,sitting in the chair. A while later Im awoken by Nurse Joy,handing me a pokebal and Ralts sits next to me,giving off a happy vibe. "What do you say? Let's go train." I say as I stand up and walk out with Ralts. "Well well well, what a cute little lady!" Axel's voice boomed out across the Pokemon Center and waltzed on up to the counter. He grinned at the nurse for a moment before taking out the two Pokeballs in his pocket. "Yeah... Think you could heal 'em up for me?" At the nurse's nod, Axel scooted the two balls over to her and then rapped the counter while he listened to the soothing music playing. Within a minute, the nurse had returned. "Hey, thanks! You'll probably be seeing me a lot for a while!" One Pokeball opened up, revealing Cyrus, and then Trainer and Pokemon made their way out, heading back to Neverseen Forest. I reach the Pokemon Center and walk in. I greet Nurse Joy and hand her Growly in his pokemon. I unwrap Rage from around me and hand him to her. She takes them and goes over to heal them. When she returns I take them from her and leave without another word. I walk back in with a smile. "Hi again Nurse Joy." As I hand her both of my pokeballs. "Just give them some rest I think and they'll be fine." I say as she nods. I go back to the chair I sat in last and doz off. A while later I wake up to Pansear tugging my at my pants and Ralts sitting on my lap. "Oh hey." They both point to the pokeballs sitting next to me. "Ok great. Let's get going." I stand up and walk out,both of the pkoemon hanging on my arms. He arrives to Fauna City and immediately heads to the Pokemon Center. He grinned as he placed the two pokeballs on the table "Nurse Joy can you heal them please. They both had a ball today and is tired." She returned a smiled to him as she showed him where to wait. He felt something sitting on the top of his head. He looked up to see Sona(Aipom) sitting on his head. He smiled as Ace sat in his lap sleep. They decided to rest there for the night before heading on to fight the gym leader. Zero casually walked into the Fauna City Pokemon Center with a content sigh and a smile on his face. As Zero approached the counter where the Nurse Joy was,he fished around his belt for Machop and Yanma's Poke Balls and placed them onto the counter. "A quick heal please miss,They're both exhausted." The Nurse nodded and took his Poke Balls and told him it would only take a minute or two. After a short while had passed on, Zero recieved his Poke Balls again and thanked the Nurse before heading out to the city. Ceru walks into the Pokemon Center, having just returned Snorunt to his Pokeball because of how exhausted he had gotten. Smiling at Nurse Joy, he handed his two Pokeballs two her wordlessly, and she nodded, smiling warmly back. A few moments later his Pokeballs were returned to him, Nurse Joy wishing him a good day and him returning the wish, grinning. Now he could train Pachirisu, and see if this Pokemon would actually go anywhere, or if he needed to hold him back from Pokemon battles. Ceru walked calmly back into the center, Pachirisu's Pokeball already in his hand. The Nurse Joy commented that he was back so soon since his last visit, concern apparent in her voice when she asked if everything was okay. Ceru nodded, and smiled, explaining that it was just training. Nurse Joy nodded at this, understanding, and smiled, assuring him it would only take a few moments. She took his Pokeball and a few minutes later handed it back, Ceru thanking her and leaving. I walk into the Center. I go over to Nurse Joy and give her my pokemon. I say nothing to her. She brings them back and I take them from her. With not another word I leave the Center, uncaring that I said nothing to her. He walked into the Pokemon Center with his hands behind his head. He greeted her with a nice smile. He was still happy that he won his first battle. "Nurse Joy my pokemon need a nice rest if you do not mind." She nodded as he handed her Sona and Ace's pokeballs. Less than a few minutes later she handed them back to him all renewed and fresh. "Thank you." He threw Ace's pokeball into the air as he landed on Kuroi's shoulder. He placed Sona's into his bag and walked out the Pokemon Center waving at Nurse Joy on his way out. I walk into the pokemon center,yet again, after defeating the first gym leader. I walk up to the counter and hand both pokeballs to Nurse Joy. "This time they need a heal. They were in a fight in the Gym. Luckily we prevailed though." I told nurse joy. "Well congratulations. Here go." She says as she then hands me the pokeballs. "Thank you.Be back soon I think." I say as I walk out,ready to look for more pokemon to capture. Ceru nearly skipped into the Pokemon Center and up to Nurse Joy, rushing the entire thing so Pachirisu's Pokeball was returned to him in the next second or so. He barely allowed himself time to thank Nurse Joy and wish her a good day, flustered and hyper as he ran out of the Center and fled to the Gym. Kuroi walked into the Pokemon Center slowly with Ace on his shoulder. Nurse Joy just nodded as Kuroi handed her two pokeballs. He walked over to a nearby chair and sat down. Ace watched over him while he slept. A few minutes later he was awaken by Nurse Joy tapping him on his chest. He woke up taking his two pokeballs back from her. He thanked her and walked out the Pokemon Center with Ace on his shoulder singing. I walk into the pokecenter to heal the pokemon one last time before he goes out. I hand it to nurse Joy and smile at the chansey. A moment later my pokemon are given back. I put the pokeballs away and walk out,preparing in search of what Ralts was looking for earlier. Zero walked into the Pokemon Center once more and smiled at the Nurse Joy as he took out Machop and Yanma's Poke Balls. "I just need a quick heal again please. I'm getting ready for my Gym Battle" The Nurse smiled at her and took his Poke Balls and told him to sit down and wait. About five minutes later she called him over and handed him his two balls back. "Thank you ma'am I'll see you later." I walk in and hand Nurse Joy three pokeballs. "ahh so you caught a new one I see." She says to me as she hands the pokeballs to chansey. "Yep. An Abra too. Gonna be a little hard to train him but once I get him to a Kadabra he'll be a great boost to the team." I say with a smile as I then go to my average waiting chair. A few moments later Chansey hands me the pokeballs and I nod to her and walk out. He walks into the Pokemon Center with Ace on his shoulders. Kuroi gives Nurse Joy a big smile as he hands her Sona and Kon's pokeballs. She took them as he went to his seat. Few minutes later she walked over to him and handed it to them. He nodded his head at her as he turned and walked out the Pokemon Center. Ceru was laughing hyperly to himself, strolling into the Pokemon Center. This feeling was so amazing, finally having his first badge. 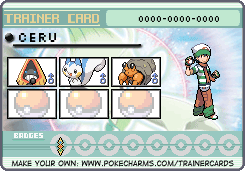 The battle had been intense and all of his Pokemon had fought so hard- Ceru was extremely proud of them. He ran straight up to Nurse Joy and set his Pokeball's down, smiling up at her. She looked momentarily shocked and then smiled back. "Someone's a little hyper, huh? Hahahaha. Your Pokemon will be ready in a moment.~" Ceru grinned at her and explained that he just got his first badge, which Nurse Joy congratulated him on. A few beats past and then Nurse Joy handed back his Pokeball's, wishing him luck on his journey. He in turn waved at her and wished her a great day, and then zoomed out the doors. He walked into the Pokemon Center with all three pokeballs in his hand. Nurse Joy just nodded at him and took his three pokeballs. Kuroi walked over to the waiting center and fell asleep. He was awakened by Ace jumping into his lap. Kuroi took Kon and Sona's pokeball and placed them in his bag. "Time to visit the gym leader." He stood up as Ace crawled onto his shoulder and headed out the Pokemon Center thanking Nurse Joy on his way out. I walk into the Pokemon Center and hand Nurse Joy Rage and my two Pokeballs as I greet her. She takes them and goes over to heal them. She returns and gives them to me. I thank her and she smiles back. I then leave the Center. I enter the center and greet Nurse Joy as I hand her my pokemon. She takes them with a smile and heals them up. I take them from her with a thanks and leave. Zero walks calmly into the Pokemon Center once again as he cheerfully greets the Nurse Joy with a smile and a wave. Slowly approaching the counter as he clutches firmly on his new egg,he places Yanma and Machop's Poke Balls onto the counter. Ah he glanced towards the Nurse Joy he cleared his throat calmly. "You mind healing my Pokemon again please? I've been training hard so I can finally do my Gym Battle soon." "Certainly sir. Just wait for a few minutes and they will be fully healed before you know it"
Zero strolled over to a bench across the other side of the Pokemon Center,as he calmly sat down on it to rest for a couple minutes himself. He glanced at the clock a couple times,scrolled through his Pokedex to currently see his progress,and checked the items in his bag to make sure he hadn't lost anything. Then there was the Egg that he received not too long ago,Zero held onto it firmly to provide it warmth in hopes that it would hatch soon. It had been moving around and jumping a bit lately and it seemed as if it was on the verge of bursting open any second now. Suddenly,cracks began forming,they grew bigger,and bigger until,the egg burst wide open and a small human-like Pokemon emerged with a proud cry. Zero smirked as he gently rubbed the Tyrouge's head and greeted it cheerfully,just at the same time, a "Ding-Dong" noise had been heard. His other Pokemon had been finally done healed, As the Tyrouge walked alongside him,Zero approached the counter,nodded to the Nurse Joy as he received his Poke Balls and waved to her as he walked out of the Pokemon Center,ready to take on the Gym Leader.